Mobile games developer and publisher Miniclip has acquired Head Ball 2 maker Masomo for an undisclosed fee. The studio has offices in Turkey and the UK and specialised in sports-focused casual multiplayer games for mobile. Its flagship titles Head Ball and Head Ball 2 have been downloaded more than 60 million times to date. "We're thrilled to have the opportunity to partner with Ibrahim and the team at Masomo," said Miniclip CEO Rob Small. "We believe the team at Masomo created a world-leading and innovative IP with the Head Ball franchise and we're proud to be able to collaborate with them and support them in fulfilling their aspirations. “Miniclip's long-term strategy continues to focus on partnering with world-class developers to bring games to new, global audiences and to 'unleash the gamer' in each one of us. We are very excited to work with the team at Masomo and are delighted to welcome them to the Miniclip family." 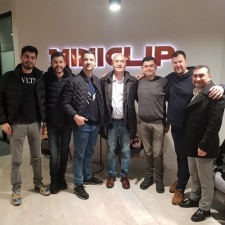 Masomo CEO Ibrahim Akman added: "We're delighted to be in partnership with the powerful and experienced team at Miniclip. We're confident that the success we've achieved with our Head Ball games will continue and we're excited to create even more successful titles working with Miniclip. "The similarity of our audiences and Miniclip's experience will bring so much value to our games and we can't wait to work more closely with them. “We'll continue to produce great new games and develop the culture we've created with my partners; Erdem Yurdanur, Semih Alev, Kerem Copcu, Murat Baysal, Oliver Slipper, Adam Perrin and our young team at Masomo."